How Do Keurig Coffee Makers Work? What Unites All Keurig Machines? There are many machines designed to make our lives better. But my personal favorite is the Keurig coffee maker. It’s always there when I need good coffee. And when I need it fast, which is very important. Do you want such a little kitchen helper for yourself? Then keep reading and I will help you find the best Keurig coffee maker. You must have already heard about Keurig coffee machines. I mean, you can find one in almost every American household. No wonder, as Keurig is one of the most famous brands on the market. It specializes exclusively on coffee machines. The company strives to deliver high-quality coffee at reasonable prices and, most importantly, allow you to enjoy that coffee in the comfort of your own home. 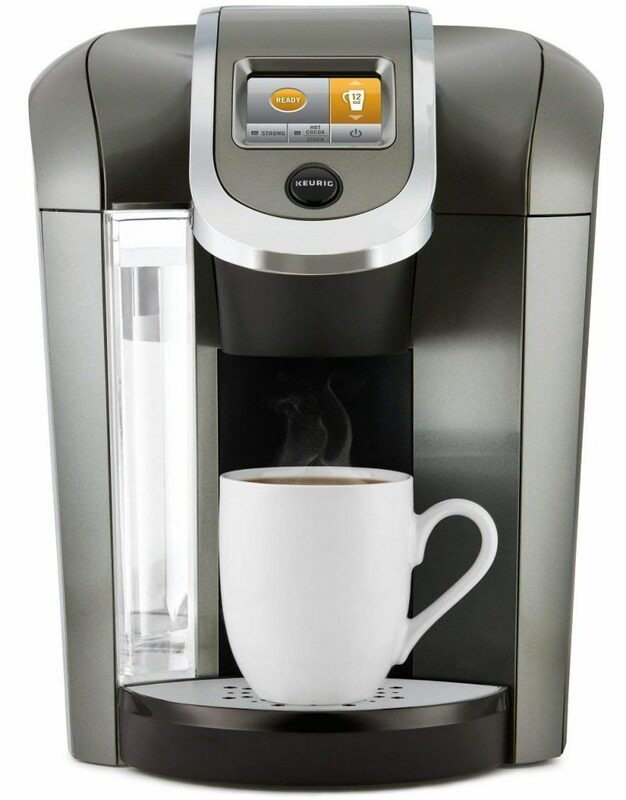 Keurig offers many machine types and designs in different price categories. What makes the company stand out from the competitors is that it has coffee makers for almost any user. There are models for home and office, big and miniature, advanced and simple. And all of them work with K-cups. This allows for extremely simple operation and minimal effort to get your beverage. All Keurig machines are single-cup models, which means they dispense one coffee serving at a time. Of course, you can control the volume and get smaller or larger quantities. There are even a couple of models that can brew a whole carafe at a time. 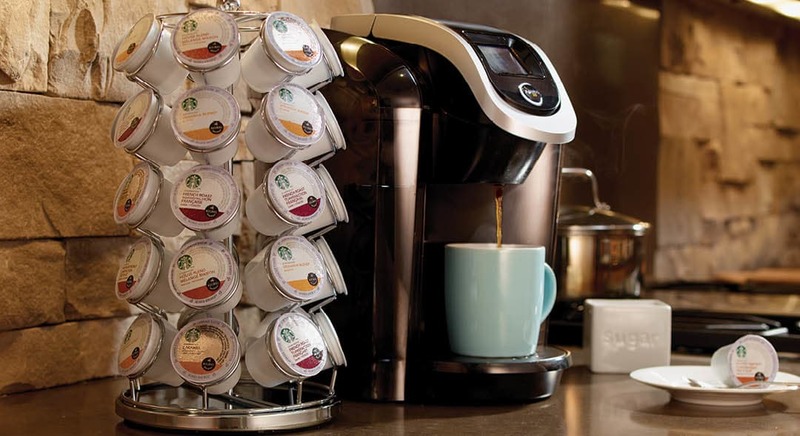 Now, Keurig machines use those famous K-cups. Let me explain. K-cups are small pods (capsules) that contain ground coffee. When you put the K-cup into your Keurig machine and close the compartment, tiny needles puncture the top of the pod, and the machine runs pressurized water through the grounds. The majority of Keurig machines have a pre-set brewing temperature of 192 F, which is the optimal temperature for coffee extraction. However, some models allow users to set the desired temperature. This gives coffee lovers a chance to adjust their beverages more. It’s an ideal option for people who want full control over their coffee. Such operation combines a bit from drip coffee makers and espresso machines. You see, the way water runs through the grounds and extracts the coffee is similar to the way regular dip coffee machines work. However, because there’s pressure involved (similar to the espresso machine method), the result is more flavorful. Now, it is natural that you might start worrying about the freshness of coffee in those K-cup capsules. The company uses special multiple-layer packaging that keeps air and moisture away from the grounds. This means coffee gets fresh to you as if it was ground right before you start brewing. Plus, some Keurig models work with reusable coffee pods. This means you can use your own coffee and even grind it right before use for the richest, most flavorful beverages. Super-fast brewing time. Typically, Keurig machines brew coffee in under a minute. Removable drip tray. This feature allows Keurig users to brew coffee straight into their travel mugs. Plastic body. To make their machines affordable and easily accessible, Keurig uses mostly plastic components. They are of good quality, but some users may still see a plastic body as a drawback. Removable water reservoir. 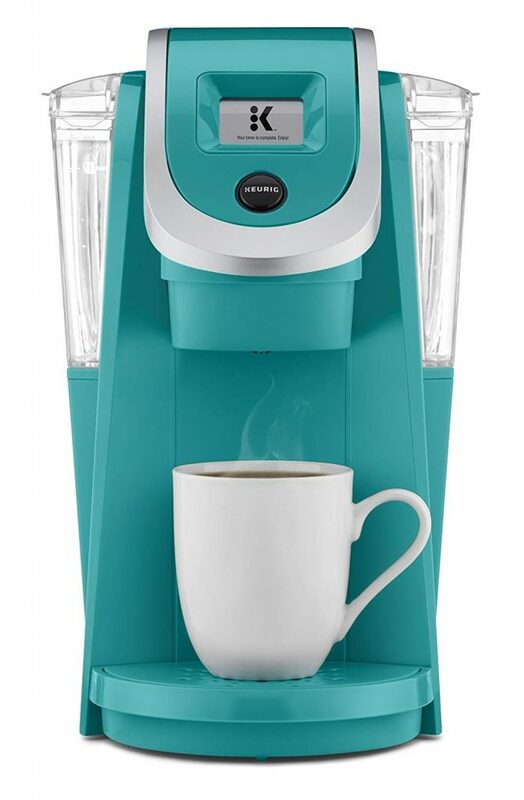 All Keurigs have a convenient construction that allows for easy refills. Keurig K-cups compatibility. These coffee makers work with coffee pods that are designed specifically for Keurig. There are dozens of brands that carry Keurig capsules and offer hundreds of different flavors. Auto-off feature. It allows the coffee makers to automatically turn off when not being used to preserve power. While all Keurig coffee makers have an energy-saving auto-off feature, some of them (more expensive models) also have an automatic On setting. This means they turn on and start brewing at the time you set, which is a great bonus, especially if you love waking up to the smell of fresh coffee. The first item on our list of the best Keurig coffee makers is sleek, nice-looking, and multifunctional. The K250 model comes in 7 different colors. It measures 13.7 inches in height and is available in seven different colors to fit into different interiors. What makes the K250 special is the brewing volumes that it offers. With this machine, you can brew a single cup (4, 6, 8, or 10 ounces), a larger travel mug (12-16 ounces), or even a full carafe (22-30 ounces). The settings allow you to adjust the volume for each specific brewing cycle. But make sure you use an appropriate K-Cup, K-Mug, or K-Carafe pod. Now, the machine has a strong brew option for single-serve brewing, which means you can even adjust the flavor. The brewing time is under one minute. The K250 has a large 40-ounce reservoir, so you won’t have to refill it too often. This model would be ideal for someone who appreciates customization and ability to choose between different beverage sizes. It’s also a great option for multiple users, large families, or coffee lovers who often invite friends to come over. 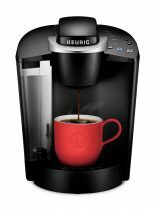 Another model that brews cup, mug, and carafe sized beverages, the K575 is one of the best Keurig coffee machines in terms of value for money. This model has probably the largest water reservoir on the market – 80 ounces. It is removable, of course. Because the reservoir is see-through and placed on the side of the machine, it makes it super easy for users to see when it’s time to refill. The reservoir allows you to brew more than 10 cups before you have to add more water, which is ideal for families or multiple users. The machine can brew 5 different cup sizes, plus 12-18-ounce mugs and a full carafe (22-30 ounces). There are also 5 temperature settings, which allows you to experiment with different brewing temperatures to find what works for you the best. If you decide to use a reusable coffee pod with your Keurig, keep in mind that it lets the water run through the grounds faster than with regular coffee pods. This might not be a huge deal, but some users believe this does not allow the grounds to extract fully. The K575 has a large, bright touch screen. It may serve as a digital clock when you are not using the machine. It also allows for effortless adjustments and settings, which is great for someone who appreciates simple controls. Overall, this model would be a perfect option for people who want good value for money and customization. With such a large water reservoir, it’s also ideal for office use. Just keep in mind that the carafe does not come with the machine. Don’t let this model’s size fool you. Despite being small and cute, the K-Mini Plus can brew a great cup of coffee. It’s one of the best Keurig coffee machines that offer both compact size and great beverage quality. Being less than 5 inches wide and only 12 inches tall, the K-Mini Plus would fit almost anywhere. It has a small 1-cup water reservoir and a removable drip tray. This machine brews one cup at a time and offers a fresh, rich flavor. You can also try the Strong Brew function, which will result in a more intense cup of coffee. There are 6, 8, 10, and 12-ounce brew sizes available. 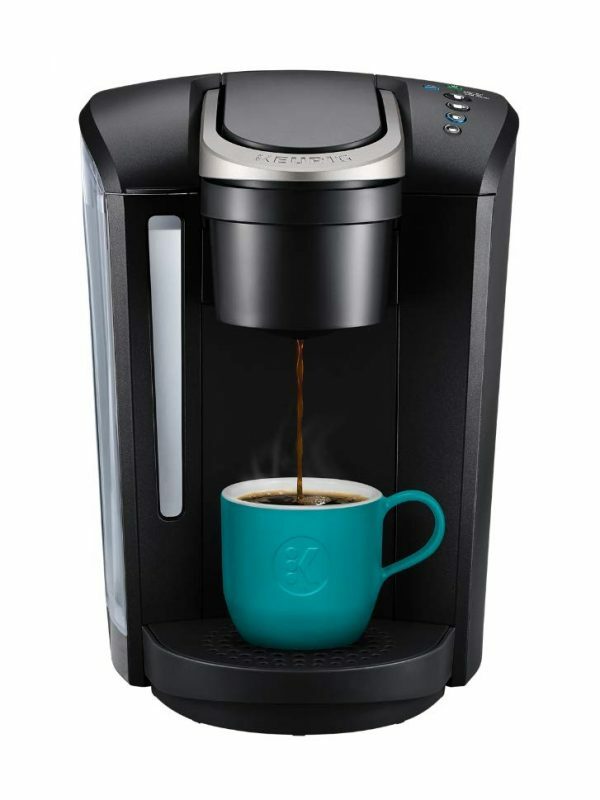 The machine comes with a handy pod storage section that can hold up to 9 K-cup capsules. It perfectly fits between the drip tray and the coffee dispenser, helping you save counter space when not using the machine. The Keurig K-Mini Plus is a perfect little brewer for people who have small kitchens and limited counter space. It’s also an ideal option for solo coffee drinkers who always want their beverages hot and freshly brewed. Being one of the most popular models, the K55 appears in many professional coffee maker reviews and is often recommended by experts in the industry. This machine belongs to the K-Classic series and offers user-friendly design and customizability (to some extent). While this machine does not let users control the brewing temperature and seems rather simplistic, it still allows for certain adjustments. For instance, you can control the brew size and choose between three different cup volumes. When it comes to cleaning, Keurigs are really easy to handle. Regular wiping and dusting are enough. Once every 6 months or so, depending on the hardness of your water, you will also need to descale the machine. The process involves filling the water reservoir with a descaling solution and running a cleaning cycle with a press of a button. And that’s it! Super easy. This machine’s water reservoir allows users to brew around 6 cups of coffee before the refill is needed. Conveniently placed on the side of the machine, it is transparent so that you could easily see when it’s time to add more water. The K55 also comes with 2 water filters, so your beverages will always taste pure. And if you use bottled or filtered water, you will get even better results! This model is ideal for people who want something simple. Because it offers a limited set of customization options, the K55 would be perfect for users who need a no-frills coffee maker. The Keurig K-Select is another simple model that can fully satisfy your coffee needs. It has a sleek body and comes with all the necessities for a good cup of coffee. The K-Select comes in 4 different colors and can fit into pretty much any interior. It has a nice matte finish and looks more expensive than it really is. Now, this model offers 4 cup sizes: 4, 8, 10, and 12 ounces. It dispenses one cup at a time, allowing users to enjoy the freshest beverages. There’s also the Strong Brew feature that makes more intense coffee. The K-Select has simple button controls. This machine does not require going through a learning curve, so it is suitable even for beginner coffee lovers. It has a 52-ounce water reservoir, meaning users can brew multiple cups without the need to refill every single time. This model would be a perfect first-time coffee maker. It is simple and easy to use, which makes it ideal for beginners. Besides, it doesn’t require you to figure out the settings you like and it has a limited number of customization options. This is perfect for beginners who are just starting their journey into the coffee world. The machine turns on and off automatically. This sometimes happens to programmable Keurigs. You just need to turn the timer off, and your machine will stop acting on its own. The coffee maker isn’t brewing coffee properly. It can either be too slow or make spitting noises. In most cases, this signals that there’s too much buildup inside the machine caused by hard water. You just need to descale your coffee maker to fix this issue. Your coffee tastes bad. Again, this can mean that it’s time to clean the inside of the machine. Don’t postpone the descaling – and you will always have a good-tasting cup of coffee. Another issue might be with the K-cup pod freshness. Make sure you read the Best Before date on the packaging before buying it. The machine is not heating. 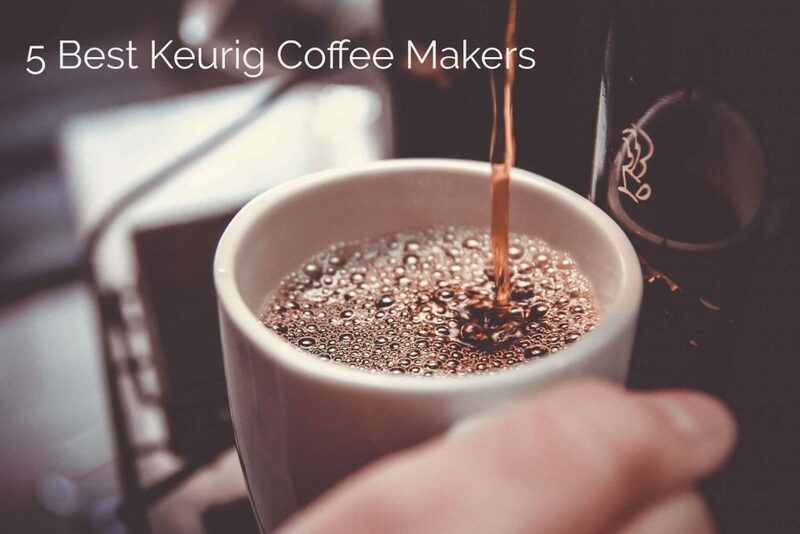 Keurigs often turn the heating element off when the water is not being properly pumped. And that happens when you install the reservoir incorrectly. So, try to reset the water reservoir and make sure you hear that “click” sound signaling you’ve done it right. The “Add Water” error pops up even when there’s water in the reservoir. This signal simply means that there isn’t enough water. Just add a bit more and brew your coffee. Sometimes this error appears when the machine is too dirty and the sensors simply do not detect the water. In this case, you need to take the pieces apart and thoroughly wipe the parts of your machine. You can now see that you don’t really have to make much effort to enjoy a good cup of coffee. Your Keurig will do everything for you. And I have an idea of which one might do it the best. The Keurig K575 really seems to have everything that any coffee lover may ever want. While it allows for multiple customization options (including the brewing temperature), it’s extremely easy to control. Plus, it brews a great cup of coffee! But if you need something simpler (and cheaper), I suggest you try the K-Select model. It’s a great little coffee maker. It is fast, simple, and most importantly, it makes good coffee every time. So, have you decided on what machine you want to have in your house? 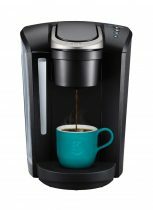 Does Keurig seem like something you would enjoy using? Share your thoughts in the comments!